Tiny Tots Ballet is for ages 2-3.5. A class created for the young dancer. Each class is 30 minutes long. Student's will learn beginning ballet positions and steps. Curriculum is taught at an early childhood education level and will use songs and props within the class course. Pre-Ballet is for ages 3.5-5. Each class is 40 minutes long. Students will learn ballet positions, steps, basic barre work, and terminology while discovering rhythm and coordination. Pre- Ballet enhances creativity, self-confidence, and fitness in a fun and lively environment, creating a love for ballet dance! Ballet 1 is for ages 6-8. Each class is 45 minutes long. It is recommended that students have taken Pre-Ballet prior but it is not required. 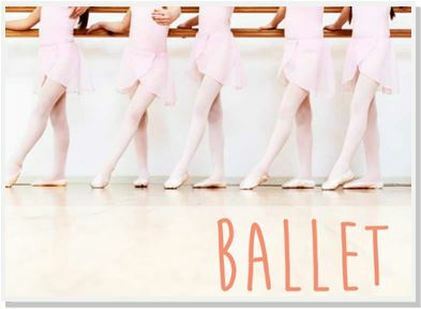 This class will cover the fundamentals of ballet and classical ballet technique. It is a more formal setting that will give students the discipline to mature and improve as ballet dancers. Strength, flexibility, terminology, and technique will be focused on. Basics of performance and performance etiquette will be introduced. This class is Ballet 1 combined with the introduction to tap. Each class is 60 minutes long. The first 45 minutes will focus on ballet and the last 15 will be dedicated to tap. Introduction to tap will include simple steps and combinations. Students will learn Tap terminology, body awareness and balance.